Grammaticalization, the process of converting regular lexical items and structures into conventionally interpreted grammatical morphemes, has traditionally been perceived as a syntactic or morphological process. Presenting a wealth of evidence from African languages, the authors argue that the development of grammatical categories is in fact strongly influenced by pragmatic and cognitive forces, factors that are located outside the confines of language structure. 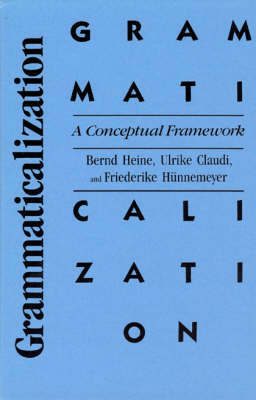 They discuss previous models and relate grammaticalization studies to alternative approaches such as localism and natural grammar theory. This volume challenges theories which describe language as a static system, as well as those which assume that linguistic categorization is based on discrete morpheme types, word classes, or sentence constituents. In contrast, the book's central argument is that both language structure and language use are dynamic phenomena and that linguistic behavior is essentially a creative activity. That creativity manifests itself, for example, in conceptual transfer leading to the encoding of more abstract concepts and of grammatical categories. Another key element of this theory is captured in the term "grammaticalization chain," which refers to a specific kind of linguistic category which cuts across morpheme types and word classes and has both a synchronic and diachronic dimension.